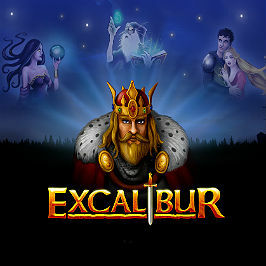 King Arthur and his cronies are off hunting the Holy Grail in this slot title from NetEnt, and he’ll need your help to unsheathe Excalibur and get his hands on the bounty. Players of this entertaining game will be seeking their own form of Holy Grail: the big prize payout of 1,500x their stake. 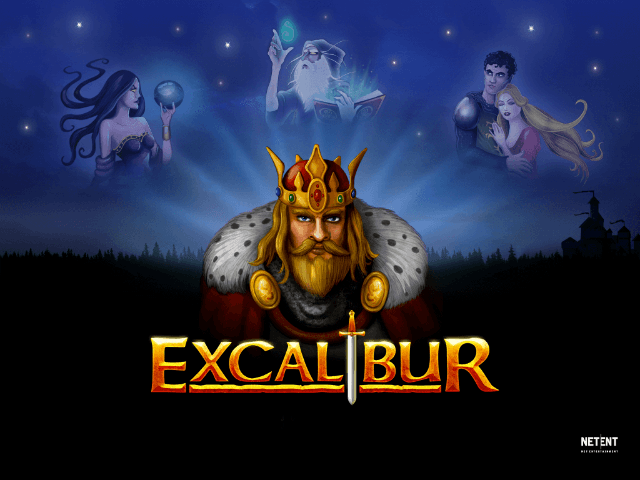 With up to 30 free spins available each time the special feature is triggered, Excalibur is a slot game that pays a handsome rate. The medieval feast will be on you! 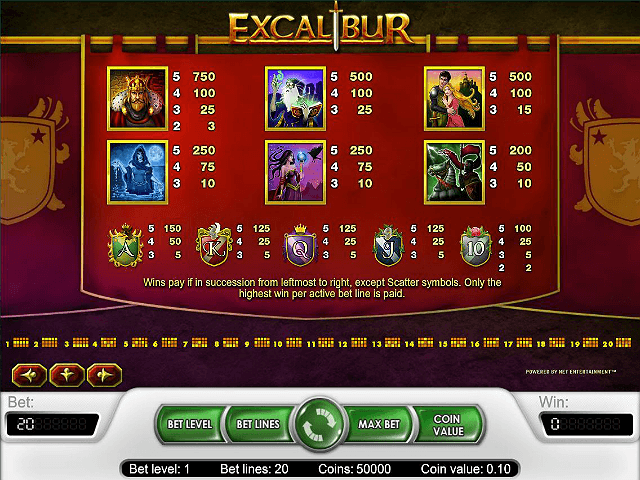 At first glance, Excalibur online slot appears to serve up the standard slot format. Five reels, three rows and twenty paylines are listed along either side of the gameboard. The game symbols include the playing card icons (displayed on a knight’s shield), which pay anything from 5 coins to 150 for matching three to five. The next rung of symbols features King Arthur’s buddies: you'll get formally acquainted Merlin, Guinevere and Lancelot. With their help, you'll gain anything from 10 to 750 coins for landing a matching combination on a payline. 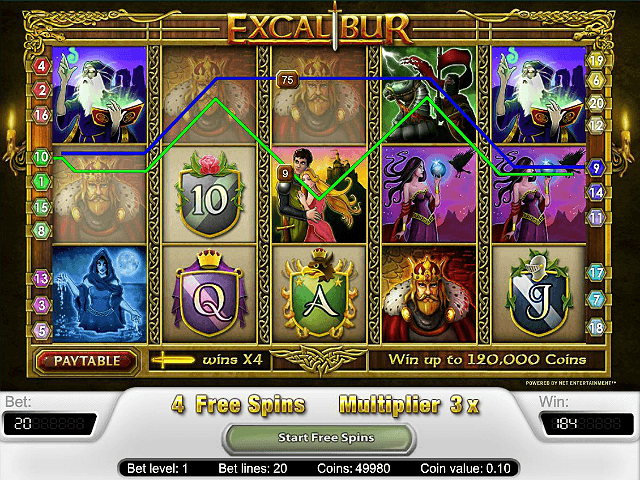 There are a maximum of 20 paylines available in Excalibur, although you can select exactly how many of those you want. There are four different bet levels to explore too, and the coin amount is completely at your discretion. This level of modification really marks Excalibur out as a game that is suitable for players of all tastes and budgets. What's more, if the payouts available in the main game weren't rewarding enough, you'll find there's even more up for grabs courtesy of Excalibur’s three special symbols. 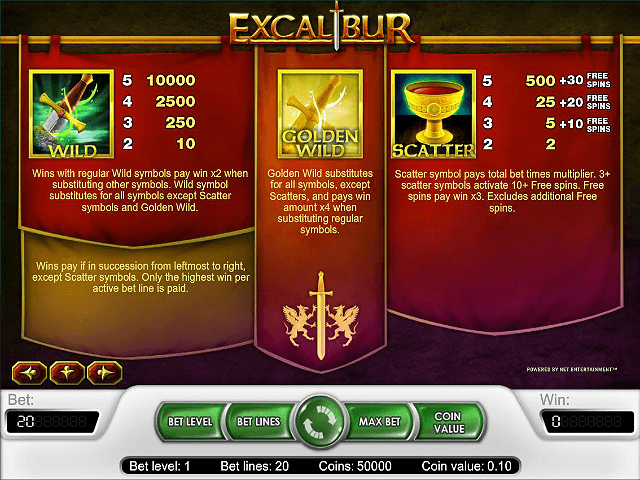 There are three feature symbols in the Excalibur online slot that help reveal bigger wins. The first is the wild, which is Excalibur itself. This symbol will substitute for all other symbols (apart from the Golden Wild and scatter) to create winning combinations that otherwise would not be in play, with the added bonus of a 2x multiplier on each. The standard wild also pays out a top prize of 10,000 coins for matching five on a payline. Next up is the Golden Wild: a solid gold version of King Arthur’s trusty weapon. This substitutes for all other symbols in the game apart from the scatter to create new wins, and delivers a rather shiny 4x multiplier for all wins to boot. The scatter symbol is the goblet of wine, which possesses a dual purpose. Firstly, it pays out handsomely in its own right – 3x = 5x multiplier of your stake, 4x = 25x multiplier, 5x = 500x multiplier. Remember, scatter wins don’t have to be on a payline either: these pay if they appear anywhere on your reels. Secondly, the scatter is also responsible for triggering the free spins bonus round. Three scatters earns 10 freebies, four rewards 20 and a full set of five hands out a whopping 30 free ones. With the help of Excalibur's special features and symbols, you'll soon find winning big is about as common as the holy grail is elusive – very. If you like Excalibur - You'll like these slots too!